Red Dead Redemption: Undead Nightmare is almost upon us, and Rockstar Games has revealed the official TV trailer online. John Marston has a ‘funny feeling’ which of course is proven right when a zombie plague occurs, and thus giving Red Dead Redemption: Undead Nightmare reason for existence! 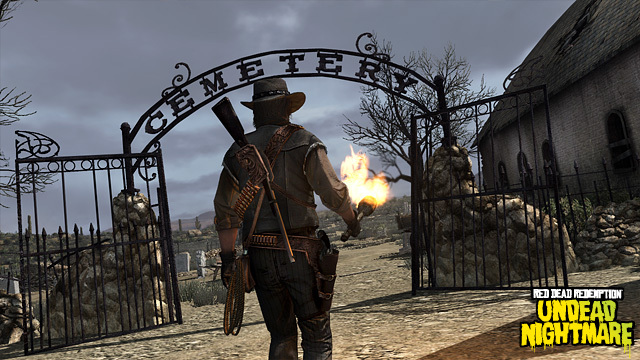 You can see the Red Dead Redemption: Undead Nightmare TV trailer below. Red Dead Redemption: Undead Nightmare is single player expansion for Red Dead Redemption and is set to come packed with loads of new features. New weapons, new missions, new multiplayer game modes and new apocalyptic horses will all be a part of Red Dead: Redemption Undead Nightmare. Red Dead Redemption: Undead Nightmare downloadable from tomorrow for 800 Microsoft Points o Xbox Live or £7.99 on the PlayStation Network. So Train2Game, will you be downloading Red Dead Redemption: Undead Nightmare this week? Which characters would you like to return? What do you think about the possible appearance of Bigfoot? This entry was posted in games, Train2Game and tagged Red Dead Redemption: Undead Nightmare, Rockstar, Train2Game by Train2Game Blogger Team. Bookmark the permalink.